No writer has managed to capture the thrill and glory of hunting as grippingly as Robert Smith Surtees, says Johnny Scott, as fans meet to mark his anniversary. Among the library of sporting publications bequeathed to me by my father is a complete set of Robert Smith Surtees’ fictional works: Jorrocks’ Jaunts and Jollities; Handley Cross; Hillingdon Hall; Hawbuck Grange; Mr Sponge’s Sporting Tour; Ask Mamma; Plain or Ringlets? ; and Mr Facey Romford’s Hounds. These lovely, leather-bound books with humorous illustrations by John Leech, published by Bradbury, Agnew & Co between 1851 and 1865, were bought from an antiquarian bookshop when my father went up to Cambridge in 1937, using the allowance he was given to buy textbooks. Surtees’ works were bibles to hunting men of my father’s generation and he could recite whole sections verbatim. No other author describes the glory, pageantry and thrill of hunting over open country as vividly as Surtees: the music of hounds in full cry, the mud, rain, fearsome obstacles, crashing falls – and the characters. Surtees was superbly placed to observe the social changes of the mid 19th century. Born in 1805, the second son of Anthony Surtees of Hamsterley Hall, Co Durham, a man described by sporting author Nimrod (Charles James Apperley) as “a true sample of an old English squire and as good a judge of a horse, a hound, a bottle of port and an oak tree as any man in England”. At the age of 14, Surtees was articled to a solicitor in Newcastle, moving to another in London when he was 17. He relieved the tedium of office life by hunting with the Surrey Hunt, later the Old Surrey and Burstow, then based in Croydon. It was on days with the Surrey that he was able to observe, with a satirist’s eye, the diversity of types who hunted in the Home Counties: City of London money men, tradesmen, merchants, farmers, market gardeners and dodgy horse dealers. 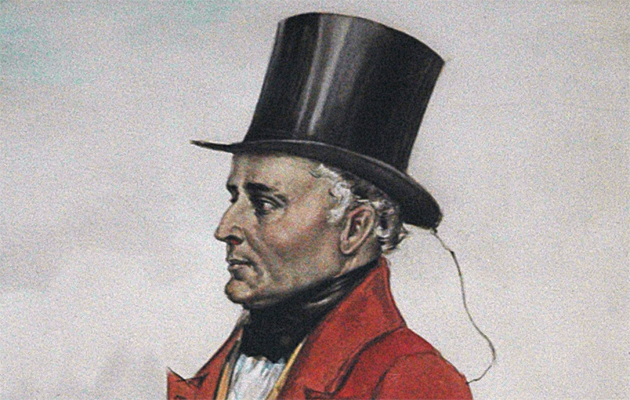 He abandoned the law when he was 23 to become a sporting journalist, replacing Nimrod as the hunting correspondent of the Sporting Magazine and, in 1831, co-founding with his friend, the publisher Rudolph Ackerman, the New Sporting Magazine, where his most famous character, the sporting grocer Jorrocks, first appeared in a series of sketches. Surtees had become heir to Hamsterley when his elder brother died and, on his father’s death in 1838, returned to take over the estate, becoming an archetypal squire of the times: attending to his responsibilities as a landlord, hunting with his neighbour, Ralph Lambton, and indulging in “his taste for scribbling”. Between 1838 and his death in 1864, Surtees published 10 works, with the 11th, Mr Facey Romford’s Hounds, published posthumously in 1865. Added to which, he was the driving force behind the initial publication of The Field in 1853. With the increasing popularity and availability of fieldsports, Surtees saw a gap in the market for a broad-spectrum, illustrated sporting and topical magazine that gave readers an overview of all that was important, including the unusual and eccentric. There were no reprints of Surtees’ works available in 1937, which led the academic and politician Sir Kenneth Pickthorn, Bt, MP to conceive the idea of forming a literary society to promote and reprint his works, maintain his reputation as an author and stimulate interest in his literary merits. At the time, Pickthorn was president of Corpus Christi College and MP for Cambridge University. The idea for such a society was minuted in the 1942 Michaelmas term papers of the Cam-bridge Conservative Association but it took 37 years before Pickthorn’s son, Charles, put it into practice. In 1979, when there was still not a single reprint available, Charles threw his energies into forming the RS Surtees Society, assembling a supporting membership, reprinting Surtees’ works and establishing an annual dinner at the Carlton Club. The Society went from strength to strength and when Sir Charles died in 1995, Helen, Lady Pickthorn took over as chairman, running it with great gusto before handing over to Rob Williams MFH in 2011. It was his idea to offer members a Northern Trip, to include a tour of Hamsterley Hall, a day’s hunting in the open country that Surtees would have hunted, followed by a reprise of the Goose and Dumpling Dinner from Hawbuck Grange, an event that has gathered momentum over the past three years. The 150th anniversary of Surtees’ death was on 16 March and to celebrate his life, the Society asked the Masters of the Braes of Derwent, Alan Chapman and Richard Spendlove, to bring hounds to Hamsterley Hall, where the current owners, Steven and Holly Spry, had kindly agreed to hold a lawn meet. Some 40 members from all over the country arrived in Co Durham on the Friday night, among them the Bancrofts from Suffolk; Lord and Lady Charles Cecil and the Earl of Verulam from Hertfordshire; the Patersons from Shropshire; Charles Moore from Kent; Paul Chenery from Rutland; Anya Pardoe from Hampshire; Huw Llewellyn James from Wales; Diana Francis; Johnny Sumption, Rob Williams and John and Sue Doble from the Westcountry; Surgeon Commander Harry Rourke from Cheshire; Pippa Grob, MFH from Wiltshire; and Paul Smith, Mark Atkinson and the Blooms from Yorkshire. The day started with a proper hunting breakfast at Auckland Castle, once the palace of the Prince Bishops, which has been saved for the nation – along with its priceless Zurbarán paintings – by fund manager and philanthropist Jonathan Ruffer, who made the facilities available to the Society. Unfortunately, Hamsterley Hall is derelict and in need of restoration but the old gothic Georgian mansion glowed in the early spring sunshine as a field of around 80 and about a hundred foot followers gathered on the lawn. More than a dozen members of the Society were mounted, with some, such as The Earl of Verulam, Godfrey and Katie Bloom, Paul Smith and Mark Atkinson, bringing their own hunters up and stabling them at the kennels. Others hired from Lesley Douglas, who brought hirelings from her famous Langlee Stables at Jedburgh, while some borrowed locally. This was Richard Spendlove’s last day hunting the Braes before moving to the Wheatland and shortly after 11am, with Belinda Penny and Alan Chapman’s nephew, Ross, whipping-in to him, he took his mixed pack of 151⁄2 couple of modern English foxhounds to the first draw, a small covert beside the Handley Cross Bridge. He then drew the walled garden, before moving through the park to Southfield Farm and Pont Wood. The open countryside that Surtees knew has been heavily planted with conifers and although the day was almost entirely woodland hunting in and out of the steep valleys dropping down to the Pont Burn, hounds flew and Ian Graham, the Braes’ trail layer, had done a splendid job and gave the field plenty of jumping. It was a delightful day’s hunting within the law, with no “crashing falls” and the full complement of members met at Auckland Castle again at 7.30pm for drinks, before sitting down to their Goose and Dumpling Dinner in the banqueting hall, under the astonished gaze of Zurbarán’s life-size paintings of Jacob and his 12 sons, which have hung there for the past 250 years. Alistair Martin, the secretary and keeper of the records at the Duchy of Cornwall, was the after-dinner speaker, beginning a highly entertaining speech with the famous quote from Hawbuck Grange: “There are two things in this world that there is seldom any mistake about – the smell of a fox and the smell of a roast goose.” After Martin’s speech, there were numerous toasts given in true Surtees fashion and the evening ended with some indeed finding, “that resuming their seats was a difficult matter”. Surtees is buried in the graveyard of the ancient church of St Ebba at Ebchester and in 2011, members of the Society visited the graveyard to find his marble headstone face down in a patch of brambles. The Society arranged for the tomb to be refurbished and on the morning following the dinner, a dozen stalwarts visited Ebchester Church to lay a wreath at the grave and attend matins, where the Reverend David Cleugh, a recent incumbent and until that moment unaware that Surtees lay outside, rose superbly to the occasion and tweaked the service to include a commemoration of Surtees’ life and achievements. The members then travelled to the magnificent Bowes Museum at Barnard Castle for a reception and lunch, followed by a riveting talk on Surtees by Lord Charles Cecil, the vice chairman of the Society. This event, attended by more than a hundred, was shared by Charles and Emma Stirling, who are leaving Northumberland after 40 years, ending a remarkable hunting career that began in 1964, when Charles Stirling became Master of the Eton Beagles, progressing through hunting the Taw Vale Beagles, the Braes, Cattistock, Braes again, South Notts, Haydon, Tanatside and the North Pennine. It was over lunch that he calculated an astonishing statistic: including visiting days, or when the home pack had the cough or were otherwise indisposed, he had hunted hounds in 24 foxhunting countries, from the College Valley in the north-east to the Seavington in the south-west. Now there’s a chap Surtees would have liked. To discover more about the RS Surtees Society, go to www.rssurtees.com.